A cameraman shoots the space shuttle Endeavour after its arrival at Los Angeles International Airport on Sept. 21, 2012. The space shuttle Endeavour is living the dream of many other twentysomethings around the world — moving to Los Angeles and becoming a movie star. A film crew and phalanx of photographers have been documenting every leg of Endeavour's journey thus far, from its departure from NASA's Kennedy Space Center in Florida atop a 747 jet on Sept. 19 to its arrival in the City of Angels in California two days later after a cross-country farewell tour. And the cameras will definitely be whirring Friday and Saturday (Oct. 12 and 13) as Endeavour makes a surreal 12-mile (19 kilometers) trek through the streets of L.A. from Los Angeles International Airport to its museum retirement home, the California Science Center. "I think it's such a special moment in our history — the history of Los Angeles, the history of California and the history of the United States," Ted Kenney of 3ality Technica, who's a producer on the film project, said of Endeavour's arrival. "We're never going to have another space shuttle moving through the streets of L.A.," Kenney added. "This is a once-in-a-lifetime chance." A cameraman captures people getting an up-close look at the space shuttle Endeavour shortly after it arrived in Los Angeles on Sept. 21, 2012. Endeavour is the youngest orbiter in NASA's space shuttle fleet, which was retired in July 2011 after 30 years of orbital service. Endeavour holds a special place in the history of space exploration, Kenney said. The orbiter was built to replace the shuttle Challenger, which exploded shortly after liftoff in January 1986. After the Challenger tragedy, "people thought we were never going to fly again," Kenney told SPACE.com. "NASA did an amazing job putting something back together — starting from scratch again in a way — to carry on the tradition of the space program." That role will likely be highlighted in the documentary, which is being put together for the California Science Center to accompany its Endeavour exhibit. The length of the finished product is undetermined at the moment, Kenney said. The documentary team — which includes producer David Knight and director Haley Jackson — will know more once they have all of their footage. "We could make this an hour film into a three-hour film," Kenney said. "I think the goal is going to be to create something that's the most informative for the young generation as they go to the Science Center — to learn about the space program, the Endeavour and what it took to get here as well." While the team's chief focus is producing the documentary for the Science Center, there may be other outlets for the footage as well, Kenney added. Endeavour is slated to go on display at the museum on Oct. 30 in a temporary exhibit. The California Science Center is building a permanent home for the shuttle, which should be ready in about five years, museum officials have said. Organizing Endeavour's move from Florida to the museum was a bit of an ordeal, and filming the journey has not been easy, either. 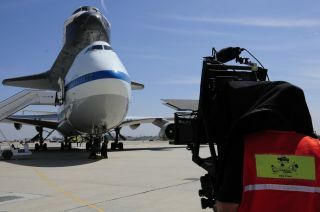 Kenney and his colleagues shooting the shuttle's journey — who include a number of volunteers from the Society of Camera Operators — have had to coordinate their activities with a number of different entities involved in the move, from NASA to the City of Los Angeles to the California Department of Transportation. And just keeping up with the shuttle as it rolls through the streets of L.A. over the next two days poses some logistical challenges, Kenney said. "Because we're in a convoy, it's, 'How do I get crew in and out? How do we get tapes in and out? How do we take breaks?'" Kenney said. "I don't want to miss anything. As a producer, you have this one shot." Despite such issues, the project has been incredibly rewarding for Kenney, who grew up in Florida and whose uncle worked at NASA. "I've worked on the Olympics' opening and closing ceremonies and Super Bowl halftime shows," Kenney said. "But I've never shot an object such as this that has so much history in it." Editor's Note: If you snap any photos of Endeavour during its trip through the L.A. streets and want to share them with SPACE.com, send the pictures, comments and location info to managing editor Tariq Malik at tmalik@space.com.